Underlining the disruptive approach that has spurred its success story, Droom, India’s pioneering online automobile transactional marketplace, has announced the launch of a unique ‘Nail Biting Deal’. The contest will allow participants a chance to win the latest bikes, scooters and cars every month through a simple auction. All that is needed to be eligible in this first-of-its-kind, limited time offer is a Facebook account to bid on the Droom’s Facebook page. With 46k+ B2C sellers, 56k+ listings and INR 2,168 crore+ in listed GMV, the latest initiative by Droom is aimed at celebrating its spectacular success as one of the fastest growing consumer Internet companies in the Indian automobile industry. The move will also delight the country’s auto aficionados, who now have a chance to Droom away on a brand new vehicle every month for as low as INR 99! To participate in this month’s event, participants will have to log onto Facebook and visit Droom’s page on May 13 between 11 AM and 6 PM. The auction will start at INR 99, while users can use the ‘Bid Now’ call-to-action button to increase the last price by INR 1. 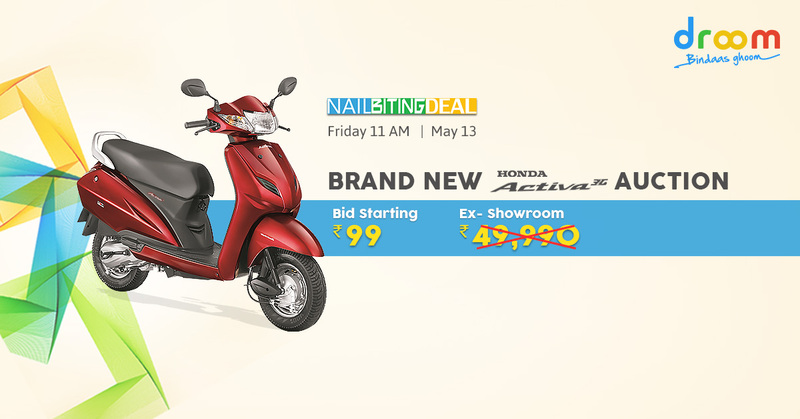 A minimum of 25 bids will be required to qualify for winning the auction, with the highest bidder taking home a brand new Honda Activa. Droom will announce the winner through its Facebook page shortly after the conclusion of the event. So come and be part of an auction that promises a nail-biting finish. Visit Droom today and get a chance to be eligible for a once-in-a-lifetime offer!